The longer you browse Safari website, the more cookies and history will be saved on your iPhone, which results in the sluggish performance of iPhone. To enjoy more smooth usage of iPhone, it is time do a sweep-up for your iPhone. Let’s begin with deleting Safari iPhone cache. How to clear Safari history iPhone? Ready to learn from the following tutorial to get how to empty cache on Safari. For how to clear search history on Safari, go to “Settings” and scroll down to locate “Safari”. Tap on “Safari” and choose “Clear History and Website Data”. After press the option, you can clear Safari history. This is how to clear Safari history iPhone via Settings. Step 1 Open Safari and tap on Bookmarks icon at the bottom. 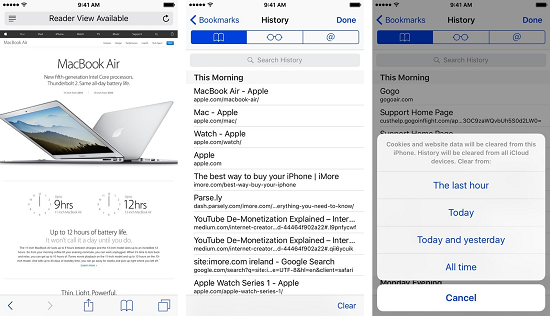 Step 2 In the Bookmarks page, tap on “History” and you can see all history you have on Safari. Step 3 Tap on “Clear” at bottom right corner and you can choose clear history based on time: the last hour, today, today and yesterday, all time. Choose whatever you want to delete Safari history iPhone. Quite simple, right? Do you get how to delete search history on Safari? Similar to how to delete history on Safari, it works same to fix how to empty cache on Safari. To empty cache Safari, open Settings on iPhone and then go to “Safari”. If you want to keep history, you can choose “Advanced > Website Data > Remove All Website Data”. If you want to empty cache Safari and history, then you can choose “Clear History and Website Data”. Step 1 Open Safari and locate Bookmarks icon in the toolbar at the bottom. Step 2 Click on Bookmarks icon and in the new page, you can see “History” option. Step 3 Choose “Clear” and there are some options for you. You can choose empty cache Safari today or all time. After you choose an option, it will start to delete Safari caches and cookies. Actually, except for cookies and history on Safari, you can also delete Safari bookmarks to make your iPhone smoothly run. Leawo iTransfer will provide one-stop solution for you. What you need to do is connect your device to computer and take simple steps to manage files on your iPhone. It enjoys super clean and straightforward interface. Once you start to operate it, you can easily know the ropes. 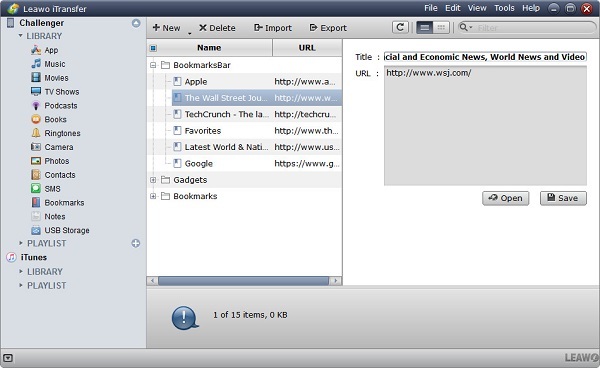 In addition to handle Safari bookmarks, Leawo iTransfer can be used to transfer a wide range of files like music, TV shows, SMS, ebooks, pictures, etc. between computers, iPhones, iPads, iPods and iTunes. No matter you want to transfer photos from iPhone to iTunes or computer, or you want to rename playlists, Leawo iTransfer can help you fix them all. Let’s cut the chase, go straight to learn how to delete iPhone Safari bookmarks via Leawo iTransfer. 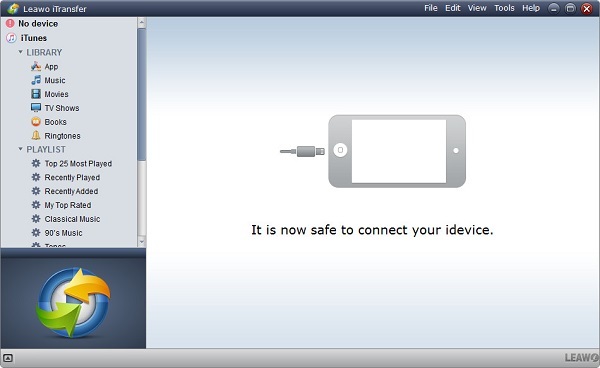 Use USB connect iPhone to computer. Download and install Leawo iTransfer to your computer. Launch it and the software will automatically scan your device and show all types of categories that are available on your iPhone. Plus, iPhone information like serial number, capacity will be exposed to your eyes. Click on the library of iPhone and go to “Bookmarks”. In the right interface, you can see a super clear bookmark list. Check bookmarks you want to delete. After that, click on “Delete” at the top. A prompt will jump out to ask you if you confirm to delete bookmarks. You can choose “Yes” to continue. In a couple of seconds, you delete unwanted bookmarks from iPhone Safari. Not so difficult as you image, right? No matter for deleting Safari bookmarks or duplicated songs or contacts, Leawo iTransfer will be a good assistant for you. 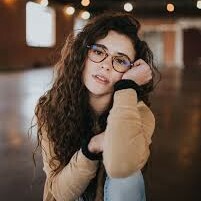 What’s more, if you want to transfer other types of contents like notes, ringtones, movies, music, TV shows, SMS, ebooks, pictures and the like, you can take advantage of Leawo iTransfer. No matter when and where, Leawo iTransfer will be one of the best file management tools for you. Why not give a shoot to Leawo iTransfer and try to discover a new wonderland? I believe you won’t regret adopting this software to solve daily tricky transferring problems.